Konsho Preserves the natural beauty of stonework construction. THE ISHINOL stone care series features permeable impregnators that never leave a film residue. The permeable surface allows air to pass through and at the sametime creates a thick water proof layer. This prevents the occurrence of rust, deterioration, weathering, and in general protects against other harmful elements that damege the natural beauty of stone. 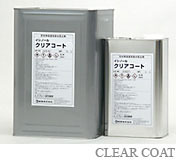 'CLEAR COAT' is the most popular for use stone protective agents which is our MAIN PRODUCTS in Japan. 'ISHINOL SERIES’ of our company is trusted most from client and high performance as the reason in Japan. Therefore, it is used all over the world now. The high appraisal has been received from the customer. It is a leading company of the industry as the pioneer of the stone protection agents. It is possible to correspond not only stone, also the tile, the brick, and concrete, etc. We have high technique, and a lot of requests are received from customer, therefore, full trust is possessed. It becomes a complaint from the customer when the stone get damaging it even if it is a very high wash effects. Our company is proposing how to wash off dirt without hurting the stone. The method of settlement of the stone trouble is supplied by a great deal of experience and high technique.